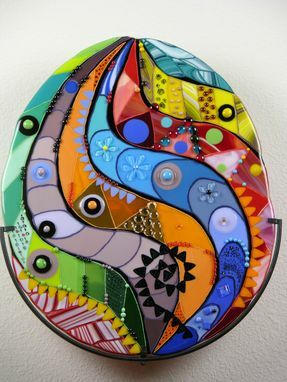 A Fused Glass Wall Artwork "A Misterious Egg"
Look at this egg. What are you thinking about? Some may think about life creation, other - about undersea treasures and creatures... This is a Mystery Egg. Place it in your living room or in the bedroom as a reminder about mysteries of our World. This is a large egg. The size is 18" x 15". The hanger is included.